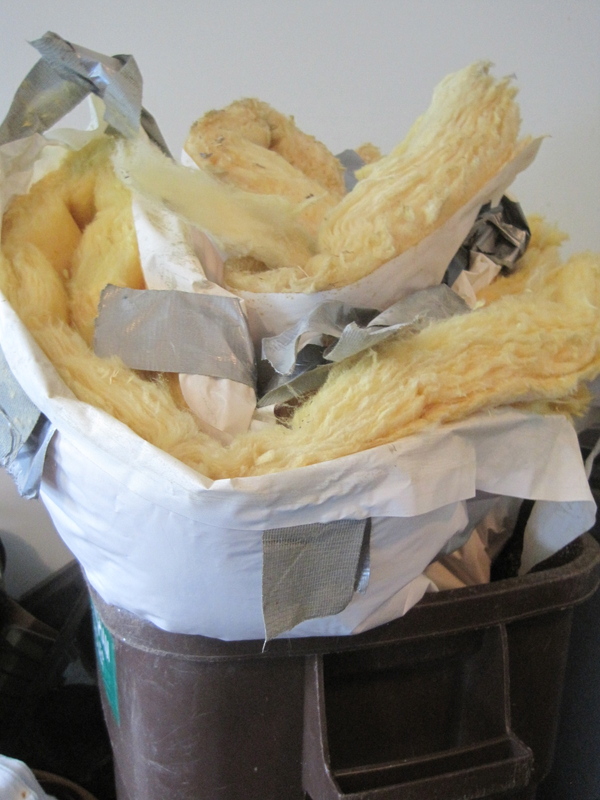 Clump # 30: Throw out insulation blanket from old hot water heater. We finally replaced our old hot water heater. No more flirting with disaster. The plumber who did the work told us to get rid of the insulation we had wrapped around it, as it was a fire hazard. Okay, water and fire disasters averted. Not too exciting, but aren’t we getting proactive! Now for prettier pictures. 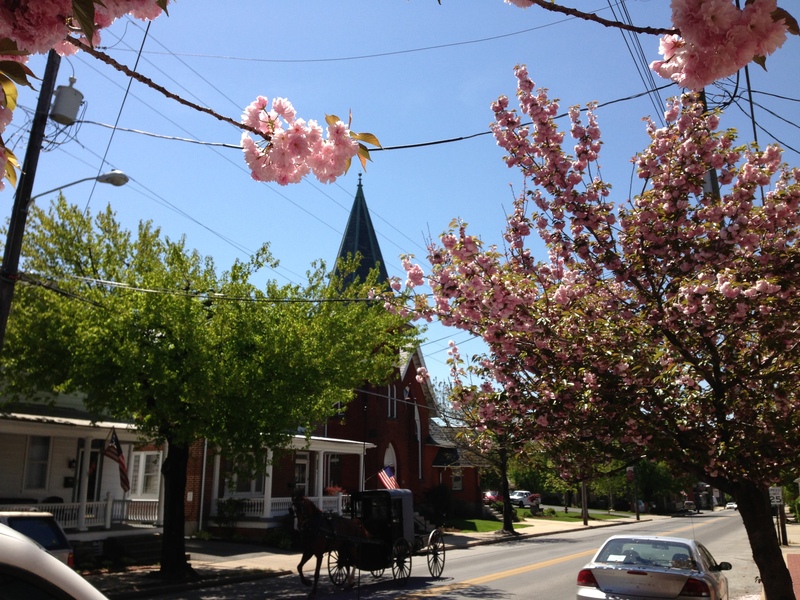 My mother lives in a retirement community in Lancaster County, PA, an area home to many Amish and Mennonite people. 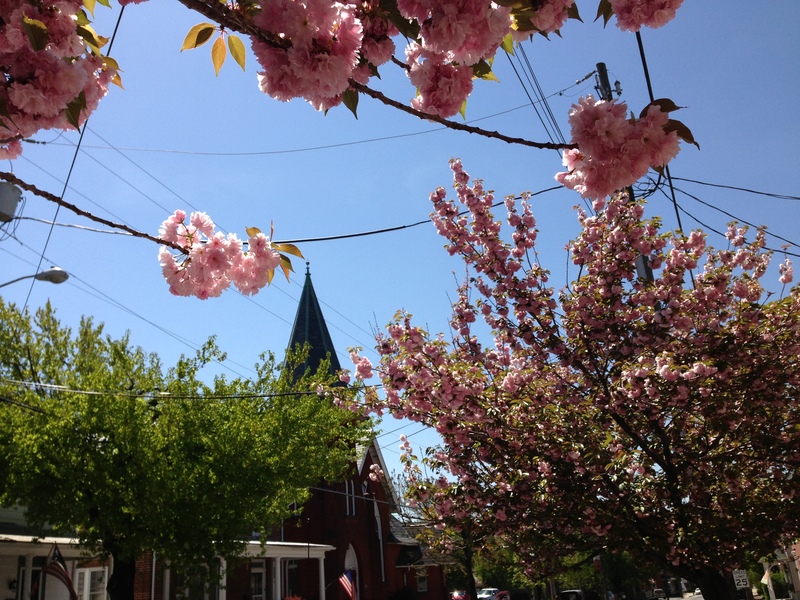 I took this photo in the town of Strasburg earlier this year when the trees there looked like garlands of pink popcorn balls strung over the street. Right after snapping the above shot, I heard the sound of horse hooves and lowered my camera to catch an Amish horse and buggy traveling through. On a more recent visit, I couldn’t find my mom in her room or in any of the common areas. One of the aides told me, “She’s upstairs — the twins are here with their aprons.” Huh?? I went upstairs to find her in a group of residents listening to, indeed, two identical Mennonite ladies, dressed the same, and passing around a collection of aprons. 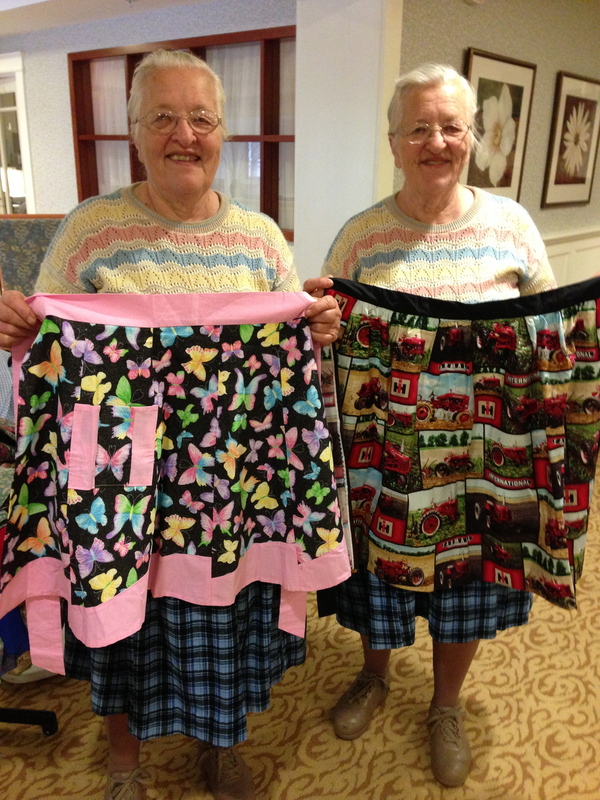 Now, you might think a presentation on aprons would not be very interesting, but, in this case, you would be wrong! As I sat down next to my mom, one twin was pointing out the “chicken scratch stitch” on the bottom of a gingham apron, a tactile and visual treat. The twins regaled us with aprons of all varieties: fancy, see-through voile ones worn over navy blue dresses by women serving as waitresses at wedding receptions that the bride’s mother would make (not sure whether this is still done); aprons made from feed bags, surprisingly pretty, floral fabrics; a “slop apron,” long, plain, and off-white, to be worn over your “good apron,” and so many more. A fishing apron had a hand towel sewn on one side for wiping your hands after handling the slimy fish, and a pocket on the other side. I asked what the pocket was for. “Your hankie,” a twin replied matter-of-factly. Of course. IRONED??????? There it was again. 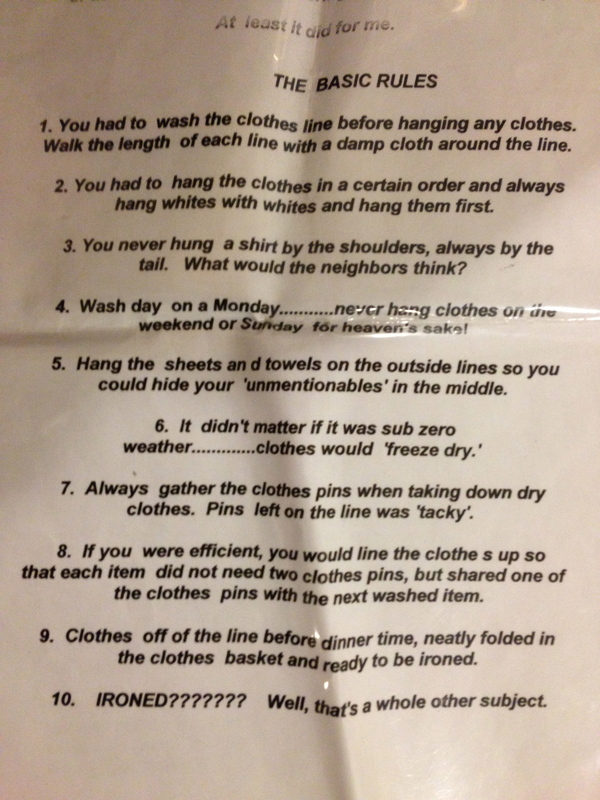 And all the laundry-hanging rules in past-tense. I am certainly not making the case for going back to more time-intensive housework, when a woman’s domain was solely in the home. Apron strings: the ties that bind, in more ways than one. But today, as women’s roles expand and technology and information explode, I can’t help hankering for a time of hankies, hand sewing, and horses. And, maybe at the bottom of it all, feeling nostalgic for the days when my mom was a force in this world, more Julia Child than Donna Reed, decked out in her apron. ← Previous Post Tear Down This Wall!